Cockfighters are on the run, or better yet, in handcuffs, like never before. In recent days, there have been rescues in California, Florida, Kentucky, Ohio, South Carolina and Virginia, and there seems to be a new resolve among so many different law enforcement agencies nationwide not to tolerate this form of staged cruelty and the wide range of criminal activity so often associated with it. Undercover federal officers infiltrated cockfighting pits with names like the Big Blue Sportsmen's Club and Red Bush in Kentucky recently. Special Agent Stan Wojtkonski of the U.S. Department of Agriculture declared in his affidavit supporting several of the indictments that one of the alleged perpetrators had bragged of selling roosters to members of Mexican drug cartels. He added that members of the Mexican Mafia had attended cockfights at the pit of one of the suspects. The man who allegedly ran that pit in Kentucky is Dale Stumbo. It turns out he is the cousin of Kentucky House Speaker Greg Stumbo, who has been an active impediment to legislation to make cockfighting a felony in his home state. It's a funny coincidence. Kentucky and neighboring Ohio have long had some of the weakest anti-cockfighting laws in the nation -- they are at the north end of the "cockfighting corridor" that stretches from there down to Alabama and Mississippi. 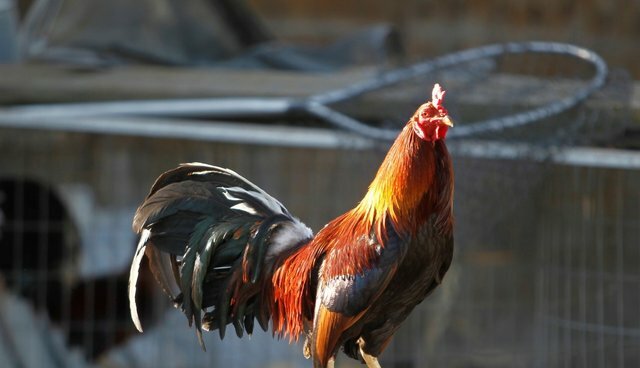 In all of these states, penalties for cockfighting are anemic, the laws haven't been upgraded in decades, and politicians have consistently sided with organized networks of lawbreakers and resisted efforts to square these states' laws with those of the rest of the country and the federal government. And so have some law enforcement officials who turn a blind eye in these states. In 2010, The Humane Society of the United States released undercover video of uniformed state police officers at a cockfighting pit in Manchester, Kentucky. This culture of tolerance for cockfighting in Kentucky has caused it to become something of a hotbed for cruelty. Now, it appears to have derailed the political aspirations of a U.S. Senate candidate, Matt Bevin, who appeared at a pro-cockfighting rally in Corbin, Kentucky, on March 29 and then falsely claimed he didn't know the event was about legalizing the blood sport. Speaker Stumbo once declared that he wasn't sure cockfighting should be illegal despite the fact that most states banned this staged animal combat in the 1800s. State Democratic Representative Richard Henderson of Mount Sterling joined Bevin as a speaker at the pro-cockfighting rally, where some 700 cockfighting enthusiasts had gathered. In his account, Special Agent Wojtkonski documented that cockfighters from surrounding states, especially Virginia and North Carolina, regularly attended the cockfights in eastern Kentucky because the laws are weak and enforcement virtually non-existent. These cockfighting pits are widely known, and hundreds of spectators assemble for the regular fights. Meanwhile, the Fulton County Sheriff's Office in Ohio raided a cockfight and arrested 52 individuals this week, just nine of them from Ohio. The remaining 43 had come from Indiana and Michigan, both states that made cockfighting a felony years ago. This was more proof of something we've long said -- that weak anti-cockfighting laws only draw more criminals into Ohio. While just nine states have misdemeanor penalties for illegal fights -- mainly in the cockfighting corridor -- most states are taking the matter with the utmost seriousness. And, with the passage of the Farm Bill in February, we've now seen the federal animal fighting law upgraded four times in the last 12 years, with the latest provisions making it a federal crime to attend or bring a minor to an animal fighting spectacle. The good news is that the Fulton County raid has created a sense of urgency to pass a much needed felony cockfighting law in Ohio. The Ohio House of Representatives has twice voted to make cockfighting a felony, but both times the measure failed to advance in the Ohio Senate. It's time for those Ohio senators to act. Meanwhile, in Kentucky, we ask Speaker Stumbo to help lead the effort to upgrade Kentucky's cockfighting law. It's the right thing to do, and it's the best way for him to show that he's morally distanced himself from his cousin, who was running a major gambling and drug operation with unspeakable animal cruelty out of a cockfighting pit in the speaker's own legislative district.